Bushwalking Skills: How to eat well with little effort, saving weight and time. How to eat well with little effort, saving weight and time. I have always admired those walkers who are so devoted to their food that they will spend 15 minutes carefully preparing their meal from the basic ingredients and then another 15 mins slowly simmering in a pot producing mouth watering aromas for all those around to enjoy. Afterwards they spend another 15 minutes washing and cleaning their utensils, with their tiny squares of ScotchBrite, surely the most unhygienic thing in their packs. They provide me with endless entertainment around the campfire, for which I am very appreciative. Despite this, I occasionally feel sorry for the "gourmets" when it starts to rain and they are still preparing their meal or cleaning up, while I have finished and can head back to my tent. I frequently recount the tale of one walker who I saw make a pizza in his Trangia pan, beginning with the flour and yeast, kneading to a dough, letting it rise and then adding the finely sliced vegetables and sausage to the tomato paste base, before baking slowly in his covered frying pan. Luckily the weather was fine and warm and we got into camp early! I'm afraid I don't have the patience. Meal time is not high on my priority list. In fact, I go to great lengths to reduce the time spent preparing a meal and the cleaning up afterwards. What could be simpler than boiling some water and adding it to a packet? Over the years I have gradually become minimalist. Rather than preparing a dessert, I usually have a twin serve of the main course and then perhaps some chocolate, if I want something sweet, followed by a hot drink. I simply add the water to my dehydrated meal, leave it to stand for 10 mins with a stir midway, and eat it out of the packet with my single eating utensil.... my spoon. No plates or bowls to wash and only a spoon to lick and a foil packet to roll up! I have even given up milk and sugar in my tea, so I have less to carry. Its amazing what you can do without and not miss! I have recently started to boil extra water with my evening meal and keep it in a small insulated flask (Thermos) overnight, inside my sleeping bag, which saves me having to light my stove in the morning and conserves both my time and a little fuel. Sure it cools down a little, but it still is about as hot in the morning as my espresso coffee would be. Preheating helps a little. It weighs a little more than a standard water bottle, but is a lifesaver when its wet and you can't get out of your tent to light the stove. What is the ideal stove for boiling 1.5L of water quickly? While my companions around the campfire laugh at my noisy MSR Whisperlite with its dramatic pre-ignition flames, they are amazed at the speed that its super hot flame can boil a litre of water. Along with its compact size and low weight, it burns Shellite (white spirits) which is very efficient, using about half the amount of methylated spirits you would need with a Trangia. Fuel efficiency means less weight to carry, something I value highly. In addition to the stove I take a single MSR titanium 1.25 L bowl with lid, inside which the stove, my lighter and grippers all fit inside. That leaves the fuel bottle, the size of which I select depending on the length of the trip and the number of people sharing the stove and my MSR maintenance and spares kit. I know what your saying.... my Trangia doesn't need a maintenance kit! I used to prepare snaplock bags of pre-weighed muesli with powdered milk premixed to which I had to just add hot water and then eat out of the bag. But why, when for less effort, I could eat an equally nutritious muesli bar pre-packaged in a waterproof packet, inside my tent, without the need to light my stove. I usually start eating breakfast while still in my sleeping bag. Lunch: foil packet of flavoured tuna, half a block of hard strongly flavoured parmesan cheese, some dry biscuits, a couple of mini- metwursts and some dried fruit and nuts. High energy food, which can survive warm temperatures. Hardly what the doctor ordered! On arrival in camp, perhaps a hot drink with some Sustagen, and a few snakes, M&Ms and jelly babies, which are guaranteed to put some energy back in most people. To which camp do you belong? The "minimalists" or the "gourmets"or somewhere in between? Where have the days gone when the first thing we did around the campfire was to pass around the mugs of Port? And I used to think that I was fairly minimalist when it came to cooking! But we agree on lunch items though I have a bread that lasts 5-6 days instead of biscuits, then do without. Breakfast is muesli and pwd milk with cold water. My new breakfast vice for mid-winter walks is to take bread (Perry's Brauenbrot) and fry it in olive oil and have with either bacon or pwd parmessan. Oh Yumm! The weight of the shallow 180mm diam alum. pan required is worth every one of its 160g. No-fuss dinners alternate between 1. spag.bol. with tom. conc. in foil packets and fr. dried meat, and 2. flavoured couscous with pres. sausage or tuna in foil or cheese with the occasional fr. dried meal cooked in bag for variety. Scroggin can make up a big proportion of the weight of food in the pack and adequte sized meals should minimalize the need for snacks thoughout the day though I once took only 3 days of scrog. on a 8 day trip in Tassie. Big mistake! ?What sort of bread to you take Mike? Doesn't it break into small pieces? Sounds like you make some delicious breakfasts and dinners. I always find that I take too much scroggin and instead rely upon a large evening meal. I take either German bread or/& Perry's Brauenbrot or very squashable fresh soft crust wholemeal rolls - they all last well and don't crumble. I forgot that my other evening meal #3. is Deb mashed potato and dried vegetable (peas, carrots, sliced beans, onion, cauli) with fr. dried meat. Do the meat first as it needs longer, then the veggies and the add potato last. Add the Deb also lets you use all the vegetable water. So easy to do but not as much fun to eat as spagetti with the manual acrobatics required. Once I've used up a my existing Fr.Dr. meals, I'm no longer going to use fr. drieds apart from the fr. dr. meat. The alternatives are much cheaper and after a day's walking, I'm never fussy about flavour. I also take powdered garlic (noone has ever complained) and a whole fresh capsicum which somehow makes me feel virtuous! Do you dry your own vegetables, Mike? Thank you for a great informative blog. The article shows a graph of comparing three main stove systems vs time taken to boil 1l of water, the graph clearly shows that with Shellite and gas that speed of boil does not equate to efficient stove use, Speed = efficiency is a fallacy that is perpetuated by stove manufacturers, the graph also shows that gas is much more efficient than shellite and alcohol. If speed of boil is your most important criteria for stove selection then a MSR Reactor stove should be first choice. I know you use a lighter Ti pot than the MSR SS Alpine pot set used in my calculations but the Whisperlite stove is still a heavier and less inefficient stove than a gas stove system and it is possible to do a three day trip with a gas stove including pots/windshield and fuel for less weight than just the weight of the MSR Whisperlite stove alone. If one is using one of the little MYOG alcohol stoves then the weight for a three day trip can be reduced even further. Thanks for your additional information in graph form and the thorough testing which is essential to make useful comparisons. Did you time to boil 1L include set up time as this would make a significant difference? Yes on your figures the gas stoves are 25% more efficient than the MSR and almost as quick. I have used the same MSR whisperlite for 15 years and the reasons I chose it have not changed: it works in the below zero conditions without any special care, no empty canisters to carry, less room taken up and no need to hunt for the special canisters overseas or even interstate in some more remote towns. The MSR also works on a variety of fuels which are readily available if white gas is not eg kero, diesel, petrol. I should mention that simmering is not something I do. 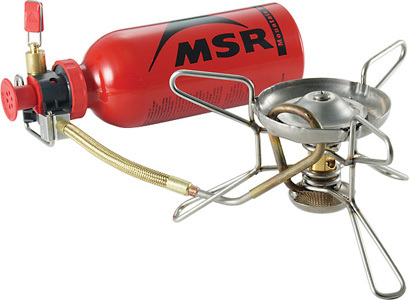 Please do not think I am knocking the Whisperlite stoves or the fact that you prefer them, as I mentioned before the MSR Whisperlite does have its place and I know many bushwalkers like you who will use nothing else, I am just pointing out that there are much lighter and easier to use alternatives. >Did you time to boil 1L include set up time as this would make a significant difference? I am not sure what your point here is, if I did include setup times then the Whisperlite would fall further behind gas stoves. For me when I am bushwalking, a few seconds or minutes longer to set a stove up and cook is of no relevance at all, where carrying half a kilo of extra weight is. >Yes on your figures the gas stoves are 25% more efficient than the MSR and almost as quick. Means less fuel has to be carried. While you have a very valid point for extreme cold conditions, using gas stoves in Australian cold is not an issue, there are several liquid feed gas stoves available now that work down to -25C, I have used my Coleman Extreme gas stove in the Australian Alps at around -20C with no warming of the canister. If I only have my upright gas stove and its cold I put the canister in my sleeping bag for a few minutes before I get up of a morning. Very good point but the same could be said for alcohol stoves and alcohol is the only one of the three fuels that is renewable. We have to disagree on that one, I usually get the canisters, stove pot handle and some other stuff in the pot. >no need to hunt for the special canisters overseas or even interstate in some more remote towns. The MSR also works on a variety of fuels which are readily available if white gas is not eg kero, diesel, petrol. I should mention that simmering is not something I do. I am unable to argue on these points other than canisters are getting easier to get OS these days. I will not go into the flare-up problems and the high CO levels which make them dangerous to use inside a tent. which emphasises the problems with gas in the cold. I do a lot of my walking in Tasmania so this is critical. Frozen boots overnight at Mt Anne recently. I have also found that the fittings are not unviversal for the gas canisters and I had to shop around to find the right one in Hobart for a co-walker on a Sunday a few years ago. I found the choice 20 years ago difficult to make, after 5 years of using gas with the problems outlined in the above article, and still see that its very personal, depending on so many variables. BTW All my gear (wind shield, reflector, lifter, flint lighter, maintenance kit and stove fit in my 1.25 L MSR titanium pot, leaving only the fuel bottle. Thanks for the link, I found the article a very interesting perspective, I was not aware of the problems that some stove users where having with altitude. You also might be interested in this article by Roger Caffin http://www.bushwalking.org.au/FAQ/FAQ_Mixtures.htm on his FAQ site (which I see you have a link to). >which emphasises the problems with gas in the cold. I do a lot of my walking in Tasmania so this is critical. Frozen boots overnight at Mt Anne recently. I do a lot of my walking in the Australian Alps and it can get very cold there too. With some gas stoves you can use them with the canister upside down which feeds liquid gas through until it hits a vaporizing tube, these stoves can be used down to -24C which is colder than it gets in Tasmania. >I have also found that the fittings are not unviversal for the gas canisters and I had to shop around to find the right one in Hobart for a co-walker on a Sunday a few years ago. Yes you are right there are a few different fittings but I have never had a problem with the STD Lindal Valve canisters even in Tasmania. >I found the choice 20 years ago difficult to make, after 5 years of using gas with the problems outlined in the above article, and still see that its very personal, depending on so many variables. Stoves like a lot of bushwalking gear are a very personal choice, with me I have many to choose from. With my winter stove setup which is a Coleman Extreme, which I use with Coleman Max canisters, I am unable to put these canisters in my pots too. I was originally from SA, I was born in Port Pirie and lived in Adelaide for 10 years before moving to Canberra in 66, I would love to walk the Flinders one day. If I know we'll be having a campfire, I dispense with the stove altogether. A $10 aluminium billy goes straight on the fire, weighs next to nothing, and the water boils in no time. Don't you feel guilty burning the home of some poor frill neck lizard or snake? While I wont get involved in the ethics of lighting fires discussion, I will mke the comment that as I understand it the link to aluminium and Alzheimer’s disease is a myth. Thanks Tony for the links. Just stirring! I use an aluminium milk billy can, with a bakelite handle myself and like you realise there is no conclusive evidence that aluminium causes ill health. Personally I love a camp fire. There is nothing like it to stimulate conversation, keep people out of there tents and if you bury the coals properly in the creek bed, no one knows .... except the animals whose homes you have destroyed. Lately I have been feeling more guilty than I once did.